I admit it. I'm a soup lover. One of my favorite things to do when we have chilly weather is to make homemade soup. I tossed this recipe together yesterday; it was really delicious. It reminds me of the chicken and gnocchi soup currently served at Olive Garden, but honestly, I like mine better. And at just 185 calories per serving, you aren't killing your waistline, either. Bon appetit! Put water, soup base, frozen chicken breasts, onions and celery into a large pot. Bring to a boil. Cover pot and simmer over low heat for 30 minutes. Mix in cream of chicken and mushroom soups; simmer over a low heat until thickened or about 15 minutes. Makes 13- 1 cup servings. Thank you to everyone who participated in this year's One World One Heart Giveaway. OK, I admit it. I'm an impulse shopper and I buy more craft supplies (and other items) than I could ever possibly use. I often buy things from antique stores and estate sales thinking that I will make these things into something else. I guess that's the altered art artist coming out in me. Anyway, I have lots of wooden pieces left over from my tole painting days from back in the day. I also have 6 plastic containers full of buttons and charms. This is a great way to use up some of those crafting leftovers. 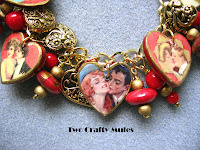 I was on a roll this weekend and made several Valentine's Day charm bracelets using items I already had at home. You can make these, too - they are fun and easy to make. The only thing that really takes any time though is waiting for your decoupaged hearts to dry in between layers of glue, paint and sealer. Using hearts as a template, trace and cut out desired images. Set images aside. Drill a hole through the top center of each heart. Make sure the hole is big enough for your jump ring to fit through. Paint the sides of the heart with 2 coats of acrylic paint. Let dry in between coats. Glue images onto one side of the hearts. Let dry. Turn the heart over and gently push an awl or toothpick through the hole until it comes out the front side. Flip the heart back over so the plain side is showing. 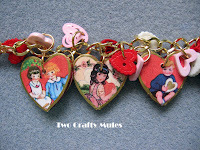 Glue the second set of images onto the back sides of the hearts. Let dry. Brush waterproof sealer over one side of the hearts. Let dry. 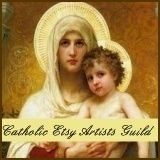 Use gold leafing pen to paint a thin frame around the image. Let dry. Brush on a second coat of sealer; let dry. Repeat process for the reverse side of the hearts. 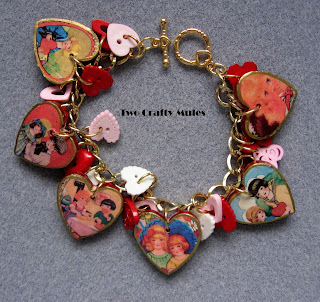 Attach the heart charms to your bracelet with jump rings and complete the look by adding buttons, charms and/or beads to your bracelet. 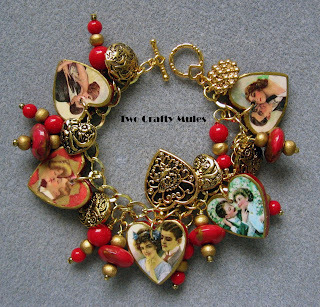 And, there you have it - your gorgeous, one-of-a-kind fashion piece. Enjoy! I've been telling you about my son Anthony and his non-profit organization, Labor of Love Charities (LOL). It's an organization he started for the homeless in Shawnee, Oklahoma 11 months ago. I am simply amazed at the progress this organization has made in such a short time. Last weekend was supposed to be LOL's first annual charity dinner, dance and auction fundraiser. My other two children (Joey and Brianna) and I made the 3 hour drive to Shawnee to attend, but unfortunately, it was rescheduled due to some crazy winter weather they were having there. Oklahoma ended up getting 10 inches of snow, ice build up on the roads and thousands of homes and businesses lost their power. Anyway, the dinner was the only thing that the charity canceled. Every Sunday at 2:00 p.m., Anthony and his volunteers feed the homeless at one of the local parks. This Sunday was no exception. Like the postman, people can count on being fed when Anthony is around no matter what the weather is like. Sunday's lunch - albeit a simple one of macaroni and cheese, buttered corn, hot dogs and buns, hot cocoa, bottled water and slats of pastries donated by the local Starbucks - served as the meal on this very cold day. When we arrived at the park, several homeless people were there waiting for us. Meals were served up in big styrofoam containers. There was plenty of food for everyone; those who wanted seconds were able to take extra food with them. I was amazed to find out from ou r homeless friends that several of the places where they go for food weren't serving meals on that freezing cold day due to the winter weather. Anthony told me that's a common occurrence - many organizations will only serve the homeless when the weather is nice. Anyway, one of the homeless said, "We KNEW you'd be here, Anthony." And because of that, they trudged to the park in ankle deep snow to get what proved to be their only meal for the day.